Cabo Verde, not to be called anymore Cape Verde, is a remote archipelago west of Senegal, ten times smaller than Switzerland, hosting half a million inhabitants. It rarely appears in the news, being remote and mostly peaceful, a quiet African country. A volcanic archipelago discovered by the Portuguese in the 15th century. Portuguese is still the official language of the country. We went there with two of my best friends, Pascal and Pierre-Alain, late May and early June 2006 for something like two weeks. 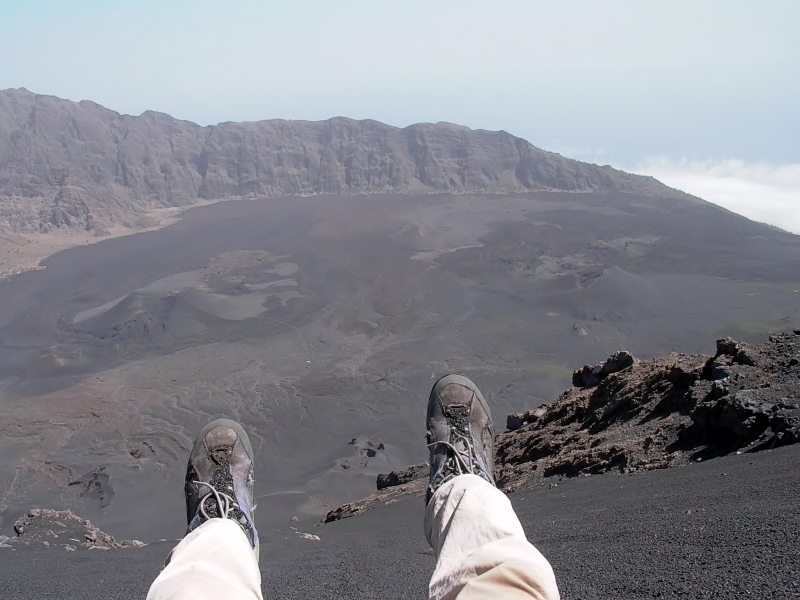 We spent most of the time on three islands: Santo Antão, Fogo and Boavista. We slept on Sal, Santiago and São Vicente on our way to the three other islands. Some islands can be reached by boat, other by air. Patience is key as strong wind is often postponing flights. The memories of Sal and Santiago are few. São Vicente and its capital, Mindelo, still resounds strongly in my mind as it is the birthplace of one of the most famous Cape Verdean artists ever, Cesária Évora. Cabo Verde is one of those countries where the music has a very strong signification, is omnipresent and has a unique character, marked in that case by the untranslatable sodade. 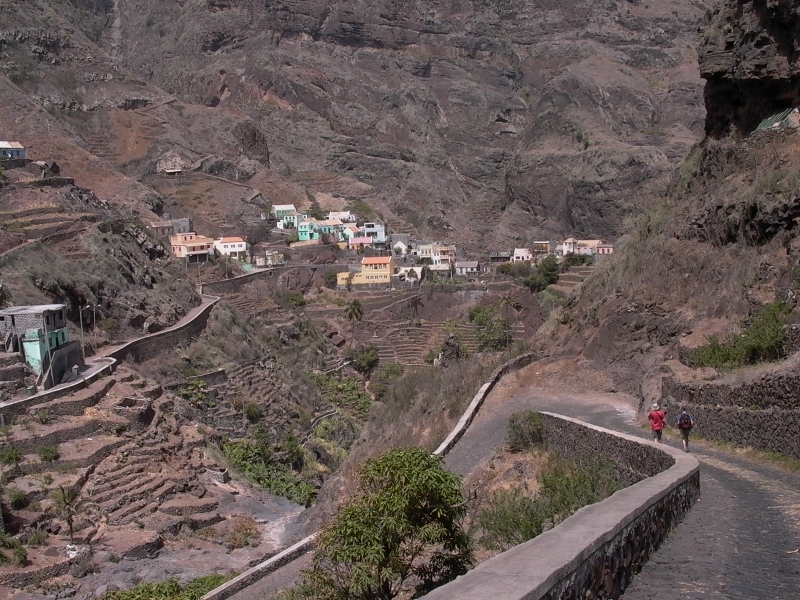 First of the three major islands of our travel experience: Santo Antão. I call it the green one, in contrast with the sandy beige Boavista and the ashy black Fogo. Not that it was green everywhere, far from it, as it was rather rocky and hilly indeed, but with much more vegetation than in Fogo and Boavista. Up and down the hills we went, or well, I should call them mountains, as they reach almost 2,000 meters high and start from sea level! The mule tracks are very well maintained and an amazement to walk on. Just beware of vertigo! The tiny and colourful village of Fontainhas will be long remembered as well. The food highlight was the freshly caught and cooked tuna, coming as a steak accompanied by, well, hum, I just remember the tuna, not the side dishes. I never experienced such a high quality of cooked tuna anywhere else so far. We were hoping every day to get it for dinner! To Fogo now, the black one, the volcanic one. Well, they all are volcanic. But on Fogo, it is more obvious as the Pico do Fogo, an active 2,829 meters high volcano, dominates the landscape. It erupted 8 years after our visit and alas destroyed the lovely guesthouse we stayed in on its feet. We even climb it as it was quiet back in 2006. The wind we experienced once on its top still resonate even stronger than the Cape Verdean music in my ears. We witnessed first the fish market in the town of São Filipe before to head to the feet of the massively impressive, or impressively massive, volcano. The ground is fertile. They even grow grapes and make wine, volcano wine. To the beige one, desert-like island of Boavista, very flat compared to the two others. It is like a shock in Cabo Verde to change island. You just feel like you change country, even continent. Its diversity is impressive considering the small size. 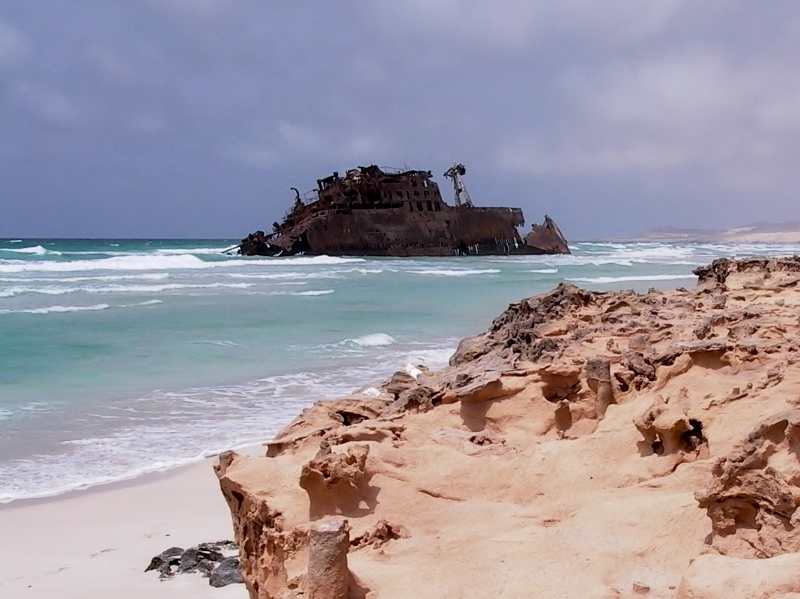 The north coast of Boavista is where you can spot the wreck of the ship M/S Cabo Santa Maria, making the place a surrealistic sci-fi like landscape.